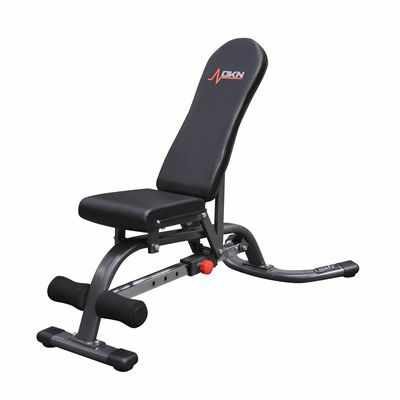 DKN's FID bench enables a wide variety of exercises, ranging from all sorts of dumbbell work to abdominal training. Thanks to its innovative adjustment mechanism, changing positions results in changes to both the seat and the backrest. At its highest setting, it provides a near upright, military position and moves through 5 different positions (including flat) to finish at a decline. In this position, the handy foam rollers provide a secure anchor for the feet, turning this bench into an ab board. This is a sturdy and comfortable bench. I am a big guy so stability is rather important for me when training. It is a well designed and finished product. The only 1 thing I would comment on is the lack of a quick release lever for the adjustment on the backrest, meaning each time I want to adjust between the 5-6 levels I have to unscrew the knob, adjust the level and then re-screw- it is only a minor detail but can be tedious when changing frequently. Using it often with no problems! for submitting product review about DKN FID Utility Bench.